It gives me great pleasure to attend this luncheon. In fact, I have been looking forward to today’s event for almost 10 months. Ms Donnell sent me the invitation last June, explaining that she wanted things to be arranged properly in advance. This is a credit to the good planning of the Monday Luncheon Club. I think you will agree that during the past three decades China has won an exceptional record with planning. This planning is achieved through creating a ‘blueprint’ every five years. The Chinese parliament – the National People’s Congress – reviewed and adopted the 12th Five-Year Plan at its recent session in March. This plan has attracted broad interest around the world. The reason is the impact of China as ranking second in the global economies and being the biggest exporter in the world. This interest should not surprise as the plan is indeed a ‘blueprint’ for economic and social development of China in the next five years. Study of the plan provides a very good guide to where China is heading and the likely global impact. Today I am very happy to give you my thoughts on the highlights of the plan. "Slower" refers to slower economic growth. The speed of growth of China over the past three decades is without parallel in global history. An IMF official has said: “The 16-fold increase in a major economy’s national income during a single generation is unprecedented”. Fast growth has become a synonym for the Chinese economy. But that is about to change. The 12th Five-Year Plan targets growth at 7% annually. This is a marked slowdown from the double-digit growth over the past 30 years. It is also a half percentage point lower than the target of the previous five years. This does not mean that China’s steady and fast economic growth will stop. Rather, it signifies a change in our way of thinking. This is a shift from speed - to quality and efficiency. - China will boost domestic demand and consumption. - There will be a focus to ensure balanced development of the primary, secondary and tertiary industries. - Equal importance will be given to consumption, exports and investment. - Priority will be given to spread economic growth evenly from the wealthier coastal areas to poorer and rural parts of China. Perhaps this analogy helps clarify the change. If China is a person, then growing tall is not the ultimate goal. Growing healthy, both physically and mentally is the target. "Faster" means we need to improve people’s livelihood with some urgency. More than a century ago the study of economics was introduced to China as a science. The word economics was translated as ‘Jingji’ by Dr. Sun Yat-Sen. This was derived from the phrase ‘Jing Guo Ji Min’ or ‘make a country strong and its people happy’. Improving people’s livelihood is at the heart of the 12th Five-Year Plan. The plan aims to share the benefits of economic development amongst everyone. In other words make their ‘Happiness Index’ higher. - An annual rate of 7% increase in people’s income - that matches the economic growth target. - There is a 13% annual rise in the minimum wage. - Over the next 5 years we will create 45 million jobs – that’s more than the total workforce of Britain. - We will build 36 million subsidised homes in cities and towns in the next five year. By then, subsidised housing will have accounted for 20% of total housing in China. - And more importantly, China expects to raise people’s average life expectancy by one year, reaching 74.5 years. - Allocate two thirds of the total central budget this year in areas related to people’s livelihood. - Make a year-on-year increase of more than 18% in education, health care, social security, job creation and subsided housing. Happiness is now a catch phrase linked to the ‘blueprint’. "Chinese people will ride on the high-speed train called ‘Happiness’. It will speed us towards a better life on the course charted by the 12th Five-Year Plan". Even The Economist wrote about the plan as “a blueprint for a happy China”. "Lower" means we must reduce pollution and energy consumption. We have come to realise that fast economic growth at the expense of massive energy consumption and environmental degradation is not sustainable. The 12th Five-Year Plan calls for green and low-carbon development. It means that energy conservation and pollution reduction will be high on the agenda. The ‘blueprint’ sets a course for a China that is energy-efficient and environment-friendly. The plan aims to develop a virtuous circular economy. This means the application of low-carbon technologies. In turn improved management can conserve and save resources. - Discharge of major pollutants will be reduced by 8-10%. - Other targets include reaching forest coverage of 21%. - Also the plan aims to have 11.4% of non-fossil fuel in primary energy usage. "Higher" means we will boost our capacity for scientific innovation. The 12th Five-Year Plan stresses the importance of home-grown innovation. This will require a national system for innovation. Business will be motivated to translate scientific discoveries into productive use. The aim is an economy driven by innovation. The trend will be “created in China” - not just “made in China”. To summarize the four catch words. China will have a more balanced economy – a happier society – a greener environment - and constant innovation. This is how China aims to achieve sustainable development in the next five years. First, we have strong leadership. China has a population of 1.3 billion. That means economic growth and governance are by no means an easy task. - and puts its people first. Only a leadership with these values is able to steer China towards full development. Second, we are blessed with hardworking and resourceful people. The source of ‘Made in China’ is the competitive spirit of Chinese workers. 'The Chinese Worker' was named by Time magazine as ‘Person of the Year 2009’. This is the only group of people to have shared the title. Time magazine commented, “the tens of millions of workers … are leading the world to economic recovery”. Chinese workers were also listed as one of the World’s Most Influential Players in 2010 by the magazine American SmartMoney. The magazine wrote that Chinese workers, “make up one of the most potent forces in the world economy”. Third, we enjoy wide popular support. The 12th Five-Year Plan is, in the final analysis, for the people of China. The commitment of the ‘blueprint’ to delivering better life for Chinese people is widely supported and welcomed. In turn this support will ensure the Plan’s effective implementation. Fourth, we have the driving forces for further growth. China is in the midst of industrialisation and urbanisation. This means a crucial phase of upgrading of industries, faster technological innovation, better infrastructure and expanding markets. If every Chinese citizen spends one more RMB yuan daily, it will add up to an extra 1.3 billion yuan in consumption a day. That is 130 million pounds a day. That adds up to nearly 500 billion RMB each year – or 50 billion pounds sterling. A multiplier effect like this can create a positive virtual cycle of ever more consumption and investment. Fifth, we have an improving world economy. The global economy is slowly recovering and is expected to grow by about 4% this year. This is despite difficulties such as the European debt crisis, rising unemployment and inflation as well as trade imbalances. China is sure to benefit from a prosperous world economy - given the openness of the Chinese economy and increasing interdependence between China and the world. China’s sustained development will surely bring about more opportunities to the world. A restructured, more balanced and greener Chinese economy will inject strong impetus to global economic growth. As China stimulates consumption at home, it is expected to become the world’s largest consumer market. Imports into China will continue to grow. The estimated value of imports are 11 trillion US dollars in the next five years. The going-global strategy of Chinese businesses has become a boost for economic growth in many countries. That means bringing these countries capital, technology, jobs and tax revenues. A China committed to this win-win progress will be a positive partner of all countries. Looking back, China has made unprecedented economic progress during that past three decades. But looking forward China is still a developing country. China has a very great uphill journey to achieve full development. Winston Churchill once said, “This is no time for ease and comfort. It is time to dare and endure”. The spirit of those words matches the challenges facing China. 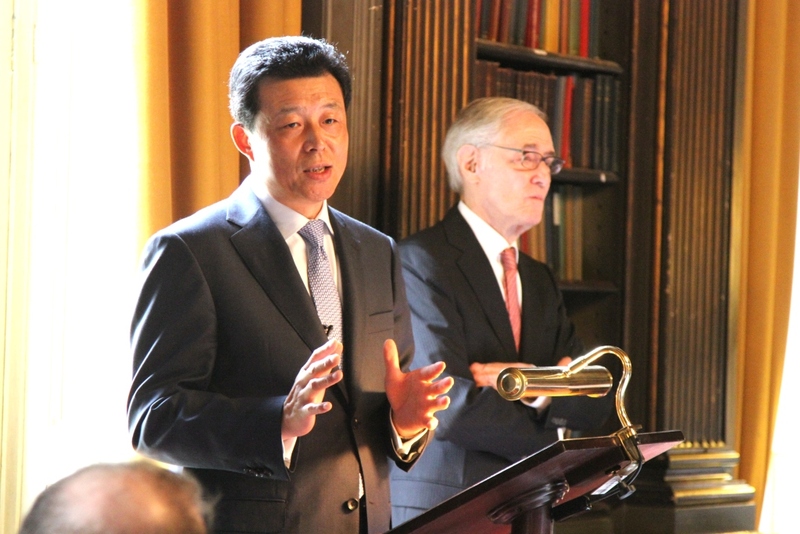 2011 sees China facing those challenges with the 12th Five Year Plan. The world can take confidence from the track record of the unprecedented success of these five year plans during the past three decades. I know that Chinese people will apply themselves to this latest plan with hard work and a pioneering spirit. In this way the Chinese success story can continue to benefit the people of China and offer opportunities that can be enjoyed by all humanity. 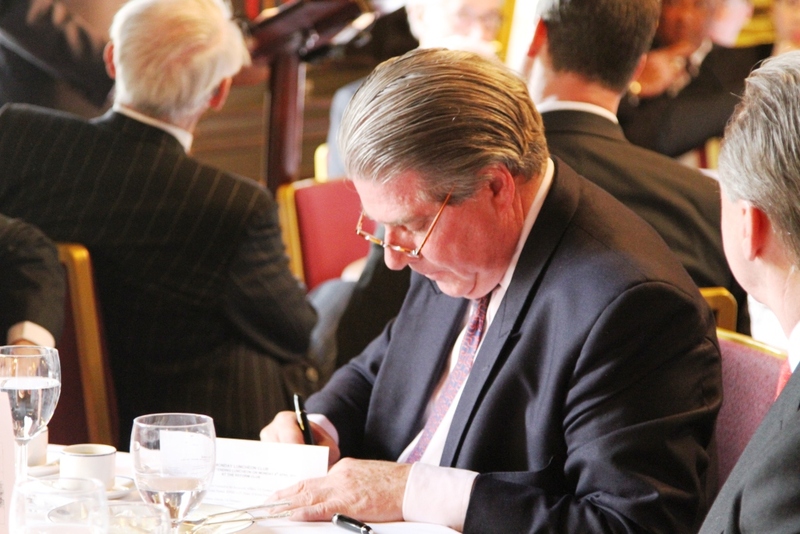 The Monday Luncheon Club was founded by an American businessman Wallace B. Phillips in London in 1937. From 1939 onwards, the Club endeavoured to have a guest speaker for each of its monthly lunches. 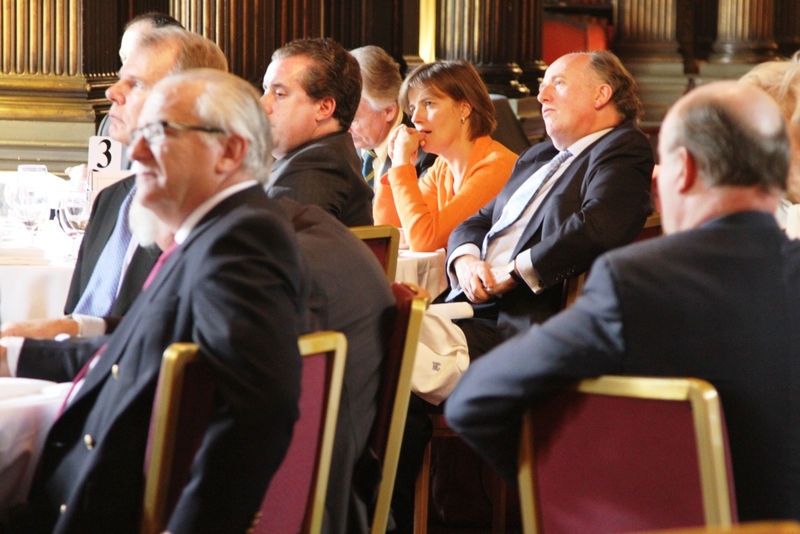 Susan Donnell is currently the Club Chairman, and membership includes some of the most distinguished American business executives in London. 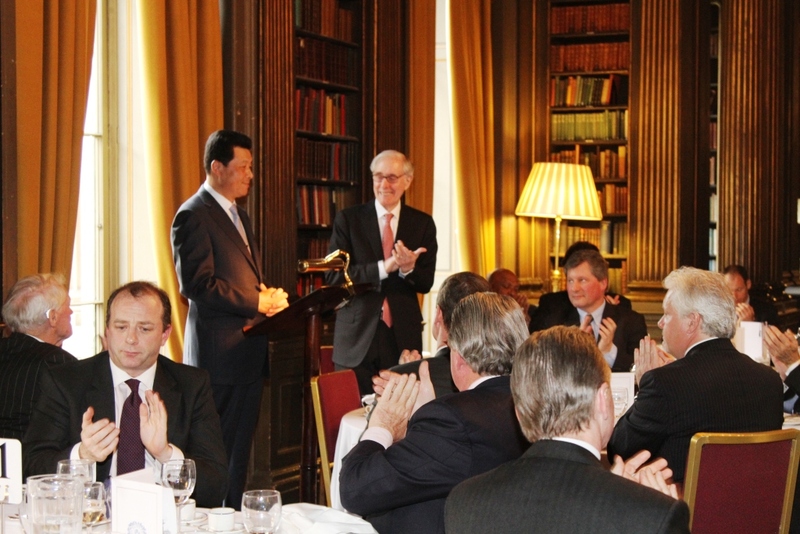 The Club has in recent years attracted many eminent guests from the British political, business and academic communities as keynote speakers, including former British Prime Minister Sir John Major, former British Foreign Secretary and Defence Secretary Sir Malcolm Rifkind, Director of Chatham House Dr Robin Niblett and ambassadors of China, the United States and Russia. 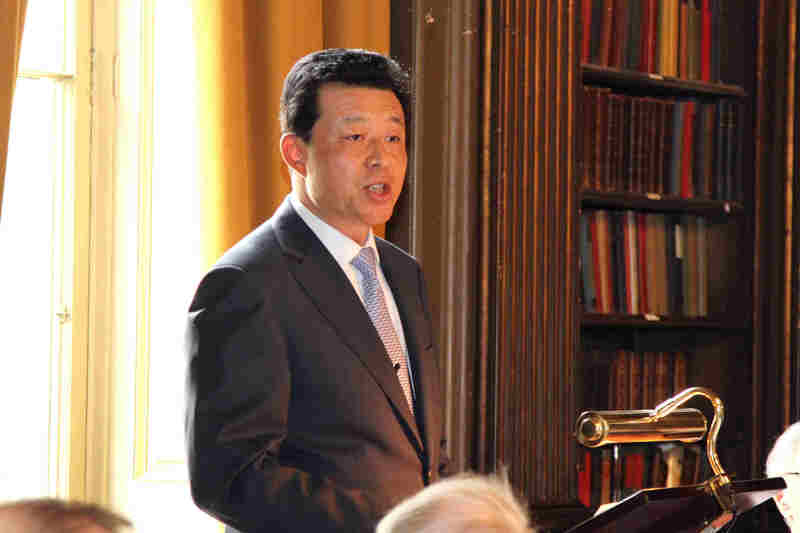 Ambassador Liu Xiaoming delivered the above speech at the Club on 4th April and answered questions on the RMB exchange rate, situation of the Korean Peninsula and the Middle East, the rising Chinese military spending, promotion of democracy and sustainable energy supply.